I am a student of Marketing Management and I have keen interest in Online shopping as well. So I use to spend a lot of time in studying online shopping trend and marketing strategies. I do online shopping as well. Today I want to present a case of Flipkart and Myntra. Customer Relationship Management is an important tool to retain customers and to make them loyal. Companies spend a lot of money in this department. Today I want to distinguish the CRM of Flipkart.com and Myntra.com through a small case. Here is the case. Few weeks earlier I put an order on Myntra.com. I bought a jacket of Rs 2000 and applied a coupon of 30% and final price was 1400 INR. I ordered the jacket and chose Cash on Delivery. I got confirmation mail and was waiting for my jacket. But in the evening I got another mail from Myntra.com quoting that the following product was damaged one and they could not afford to send the same and no extra piece was there in their inventory. So they cancelled my order and gave coupon of 30%. I saw the mail. They clearly mentioned that product quality was so poor that they did not wish to send. I do not know the exact reason but they made it clear or tried to give a message that they do check their product before shipping. Next morning I saw 2 missed calls on my mobile and when I called it back I found that it was from Myntra promotional call so I cut it. Soon a lady called me back and asked me to excuse them to not to send the product. She described why they can’t send it and about the coupon they gave to me. I was also satisfied. Myntra.com did not deliver value but they made me to trust their product. Though earlier I have purchased products worth RS 10000 from Myntra.com and have lot of trust on their shipped products, still it pushed me to be loyal to brand Myntra.com. Now 2nd scenario. Next day I put an order on Flipkart.com. 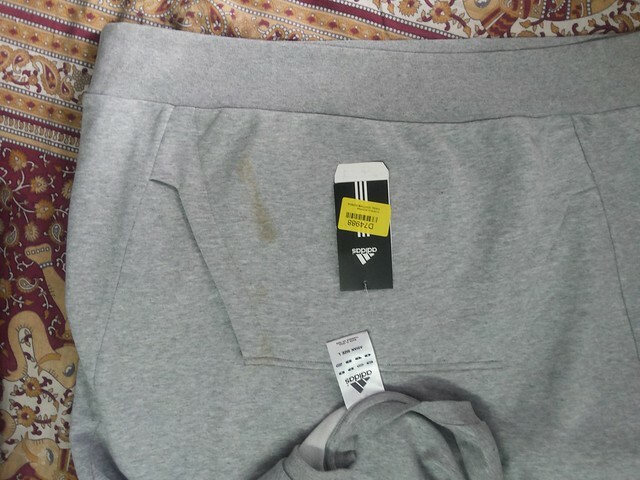 I bought a Adidas Sweatshirt worth Rs 2000 with 50% off. The product was very handsome and brand was Adidas. I purchased without having a second thought and received the product 2 days later. Here a snapshot of what I received. Poor Adidas Poor Flipkart.com. Now I am comparing both scenarios. In one hand Myntra.com checked the product and found damaged and did not ship and called me to let me know. On the other hand Flipkart.com sent me a branded sweatshirt with blot on it. I was totally surprised. But I could not afford to send it back because I could not get such a cheaper offer and product was Out of Stock. So I knew that Flipkart would not send another one. They will refund my money which I did not want. So my friends suggested me to wash it. I put some chemical and wash the blot (दाग) after 15 minutes. I thought if it (दाग) goes then ok otherwise I will send it back. I did not tear tag and other thing. But luckily when I dried it out, it went and now it looks like a new one. In first scenario the brand was not known. It was Fort Collins. But in Flipkart’s case both brand as well as vendor are having a good reputation in market. Flipkart.com need to check their product before shipping. It would hardly take 2 minute. In case of electronics items you cannot open the case but you can check cloths. If customer received damaged product, it gave negative feedback and ultimately you have to pay for it. If customer sends it back, you have to return money and incentives which will take extra human resource as well as cost to company to give him shipping cost. So I would suggest that you should have a quick eye on the product before you ship. Recently Samsung sent a stone instead of mobile phone and the customer dragged the case to court. Similar case happened with Apple. A customer gave an order of 2 iPhone of worth 2000 $ and after few days she received 2 apples (fruits) again the case reached to court. If Samsung and Apple check what they are sending, they could save money and reputation. Flipkart is also doing very well. They also have a dedicated CRM team. But somewhere in my mind Myntra.com won more trust than Flipkart.com.